From grams to ounces to halves to eighths, there are a lot of metrics thrown around in the weed industry. And, if you’re new to marijuana, you might find yourself a little baffled by what the heck it all means. While you probably still get by just fine with telling your budtender that you want to buy $X amount of cannabis, it’s most definitely in your best interest to have an understanding of what these metrics are so you can make smarter, more economical purchases. To take the guesswork out of marijuana weight, we’ve created this handy guide explaining everything you need to know so you can be an informed consumer. 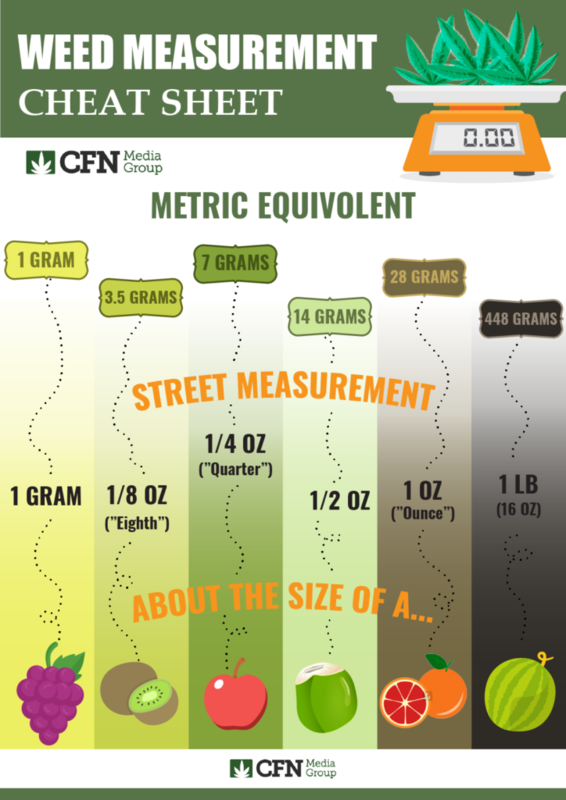 As you go through these metrics, you might notice that the smallest metrics are represented by the metric system (ie grams) while the larger metrics transition into the imperial system (ie ounces). Just know that you’re not reading it wrong; marijuana metrics just so happen to be very confusing in this way. During your lifetime you might’ve heard a person or two refer to a “dime bag” when talking about weed. The exact amount that this refers to is half a gram and, generally speaking, half a gram costs around $10, hence the name dime bag. These days, you won’t find many dispensaries that are willing to sell such low amounts; however, the standardization of weed across the country is driving prices down so you will find places that sell a whole gram (versus half) for just $10. One gram is likely the lowest amount you’ll be able to purchase in a dispensary and it can range from $10-$20 depending on the quality of the cannabis. The next highest metric for purchase is what’s commonly referred to as “an eighth.” This is where things transition, as mentioned, from the metric system to the imperial system. An eighth simply means an eighth of an ounce of weed, which is approximately three and a half grams of marijuana. This amount tends to last for one to two weeks for regular smokers but can last much longer for those who occasionally partake. You’ll find that most dispensaries charge anywhere from $20 to $50 for this amount. A quarter is the next commonly available metric for cannabis and, you might guess by now, that it means a quarter of an ounce. The amount is twice as much as an eighth, coming to approximately seven grams of marijuana. This amount is ideal for regular smokers who don’t want to make too many trips back and forth to the dispensary. Prices for quarters tend to range from $30 to $60 depending on how quality the cannabis is. Next up is a half, which, of course, means half an ounce. This is twice as much as a quarter and amounts to 14 grams of cannabis. A half should last most regular smokers for a few weeks, so it’s a great option for those who prefer to stay home rather than take trips to the dispensary. Prices vary, again depending on quality, but most dispensaries sell a half for anywhere from $100 to $150. The highest metric of cannabis available is typically one ounce. Being that it’s twice as much as a half, you might have already guessed that an ounce equals 28 grams of marijuana. If you have a particular strain that you love and want to stick to, then it makes sense to purchase an ounce to reduce the number of times you have to hit up your dispensary as well as save a little cash. Costs for an ounce of weed range from about $215 to $300 depending on its quality. Speaking of saving a little cash, it’s worth mentioning that the more marijuana you buy, the less it costs you, so it’s a good idea to buy in the biggest bulk that makes sense for your lifestyle and budget in order to save some money. You’ll also notice that, in addition to costs varying by quality, the cost of cannabis (and how much you can buy) also varies by state. In states where recreational marijuana is legal, overall pot prices tend to be driven much lower than in states where it’s just medically legal. For example, an ounce of high-quality marijuana in California should cost you between $200 and $245 while the same strain and amount might cost you as much as $350 in New York. The measurements we’ve covered thus far are the basics of what you need to know to be an informed cannabis consumer, but there are some additional measurements that are good to know if you want to be as knowledgeable as can be. And they’re especially useful if you’re more into concentrates than smoking the flower. There are a number of different chemicals in the cannabis plants, but the one that’s responsible for that happy-making stoned feeling is THC. That said, it’s good to know just how much THC you’re getting per dose and what, exactly, that means so you have better control over your high. The average amount of THC in cannabis plants for purchase in Colorado is between 15% and 30%, and that number is expected to increase as more potent strains become available. Concentrates, on the other hand, can go up much higher. If you have an affinity for ingesting cannabis via wax, hash, shatter, or edibles, then you might notice on the packages that the measures switch from displaying percentages to displaying milligrams (confusing, we know). But it essentially means the same as percentages. For instance, if you see that a concentrate has 70 mg of THC per dose, that means it’s comprised of 70% THC. Concentrates also tend to be much stronger and more potent than edibles and flower, but the effects of edibles often last the longest. Hopefully this clears up the often confusing marijuana metrics for you so that you can make informed, economical purchases for the rest of your marijuana future.